"With no ploughing, weeding, fertilizers, external compost, pruning or chemicals, his minimalist approach reduces labour time to a fifth of more conventional practices. Yet his success in yields is comparable to more resource-intensive methods...The method is now being widely adopted to vegetate arid areas. His books, such as The One-Straw Revolution, have been inspirational to cultivators the world over." --New Internationalist Every now and then you read a book which is so inspiring and such a pleasure that you feel impelled to stride down the street shouting "read this!" Well, I've just read The One-Straw Revolution and I urge everyone to buy or borrow a copy without delay. Masanobu Fukuoka (1913-2008) was born and raised on the Japanese island of Shikoku. He was the oldest son of a rice farmer who was also the local mayor. Fukuoka studied plant pathology and worked for number of years as a produce inspector in the customs office in Yokohama. But in 1938 he returned to his village home determined to put his ideas about natural farming into practice. During World War II, he worked for the Japanese government as a researcher on food production, managing to avoid military service until the final few months of the war. After the war, he returned to Shikoku to devote himself wholeheartedly to farming. 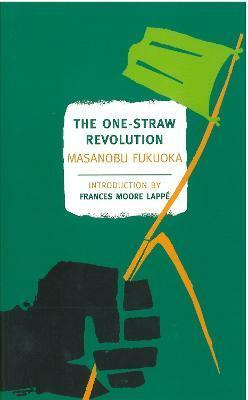 And in 1975, distressed by the effects of Japan's post-war modernization, Fukuoka wrote The One-Straw Revolution. In his later years, Fukuoka was involved with several projects to reduce desertification throughout the world. He remained an active farmer until well into his eighties, and continued to give lectures until only a few years before his death at the age of ninety-five. Fukuoka is also the author of The Natural Way of Farming and The Road Back to Nature. In 1988 he received the Magsaysay Award for Public Service. Frances Moore Lappé is author or co-author of sixteen books, including Diet for a Small Planet and Getting a Grip: Clarity, Creativity, and Courage in a World Gone Mad. She has co-founded three organizations, including the Institute for Food and Development Policy and, more recently, the Small Planet Institute, which she leads with her daughter Anna Lappé. In 1987, she received the Right Livelihood Award, also called the "Alternative Nobel." She has received seventeen honorary doctorates and has been a visiting scholar at MIT.